Today I have a card I created using Susan’s new Garden Notes Flame Lily die set. This is my first attempt will continue to work on them. Step 1 Create card base from 110# white Soft Finish Cardstock. Mine is 5-7/8″ square instead of 6″ square as I wanted my embossing folder to work. Step 2 Cut white Soft Finish Cardstock 5-7/8″ square then emboss. I trimmed away the top part of embossed piece along curved line. Although I don’t know the name of my embossing folder or the maker I did look on line and found that Joyful Home and Tatter Lace do make some similar ones. Using Clear Double Sided Adhesive to attach embossed piece to card front. Step 3 From 110# white Soft Finish Cardstock cut 3 Garden Notes Flame Lily cut leaves and stamen from green cardstock. Using alcohol markers in colors of your choice color petals (I have 2 red and yellow and 1 purple and green) then shape using Garden Notes All Metal 4 pc. Tool Kit. Susan has how to videos on her Facebook page Susan’s Garden Club. Step 4 From green cardstock cut set of Garden Notes Ladder Fern. Shade with Distress Ink and pinch up on fronds to give dimension. I also cut set from fun foam and made my own stamps – cut 3 each and stacked them together. I used glue as my foam did not have adhesive on back. Using green ink I stamped a few ferns on upper top left of card front. Step 5 Build your arrangement starting with ferns adhering with Kids Choice Glue. Build lilies on card then add leaves. Step 6 From black glitter paper w/ Clear Double Sided Adhesive on back die cut Suzanne Cannon’s A Way With Words Small Happy Birthday. Adhere to upper right of card. Step 7 Add self adhesive pearls. 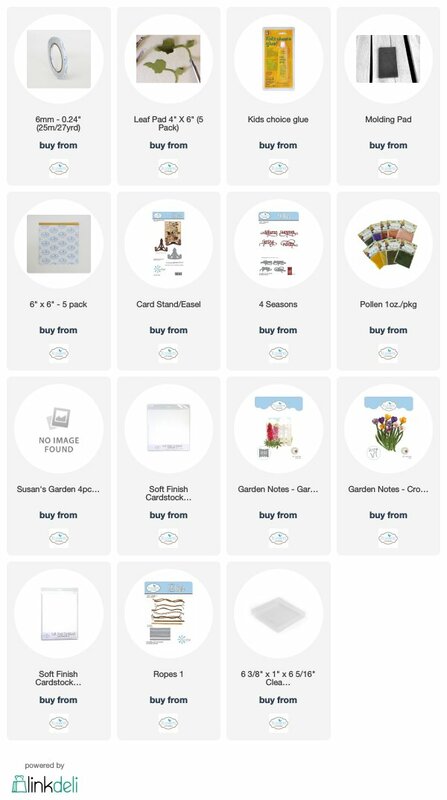 All the Elizabeth Craft Designs Supplies used on project are linked below just click on any picture you will be taken to their site. Hope I have inspired you to go make a card. Embossing Folder – do not know name or maker of one I used but after searching a bit I found that Tattered Lace and Joyful Home have similar folders that could be used. Today my card features Susan’s Garden Notes new Crocus and Garden Fence dies along with Suzanne Cannon’s A Way With Words 4 Seasons die set. 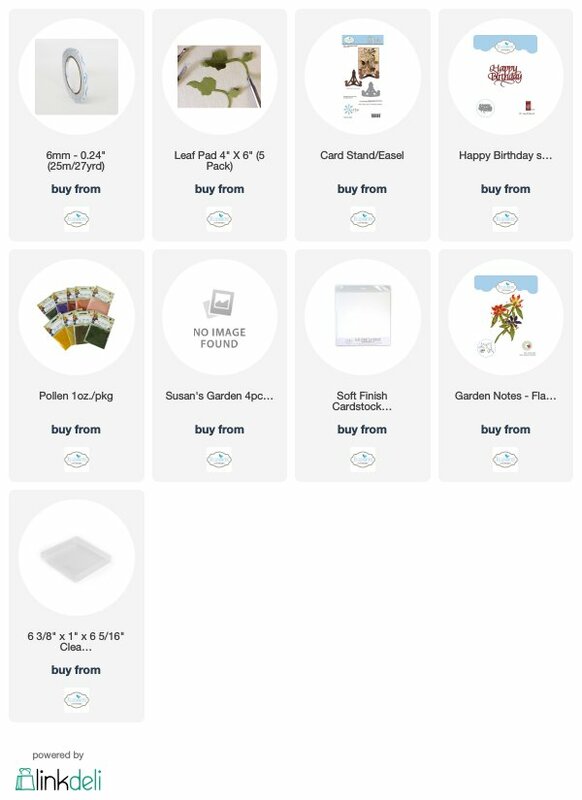 Step 1 form 6″ X 6″ card base from color cardstock of your choice. Step 2 Cut white Soft Finish Cardstock 5-3/4″ X 5-3/4″. 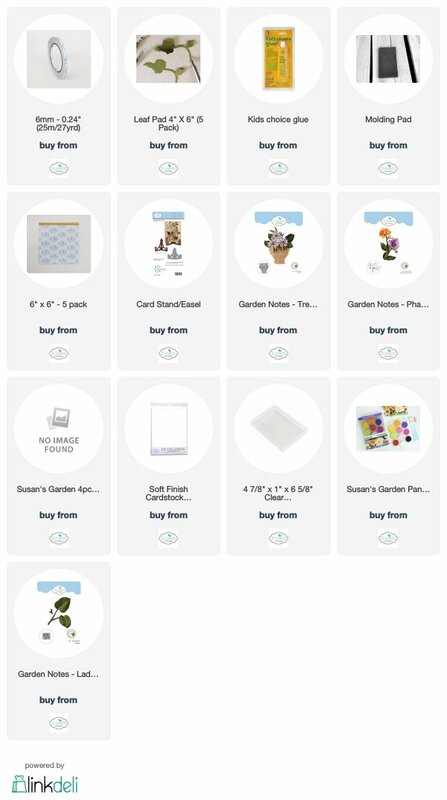 Using next to smallest die in Garden Notes Frame It – Stitched Rectangle die set cut rectangle 1/2″ down from top and allowing approximately 1-1/2″ on each side cut opening. Step 3 Either use piece of patterned paper or make your own background piece attach to back of opening. Adhere to card front using Clear Double Sided Adhesive. Step 5 Cut 2 Garden Note Garden Fences from cardstock with Clear Double Sided Adhesive on back adhere 1 on top of other. You can use white or colored cardstock. White Soft Finish Cardstock used here then colored with Copics W3, W7 and E84. Adhere to card front. Step 6 Cut a strip of grass using CountryScapes Land and Sea shade with distress ink. Step 7 Cut 4 ropes from 2 different color cardstocks with Clear Double Sided Adhesive on back Using Elizabeth Craft Designs Ropes 1 die set. Step 8 From black cardstock with Clear Double Sided Adhesive on back cut Spring using Suzanne Cannon’s A Way With Words 4 Seasons. Adhere to top of card over cutout. Step 9 Assemble – build crocuses on card using Kids Choice Glue add leaves then grass. Add ropes to each sides. Hope this has been an inspiration. 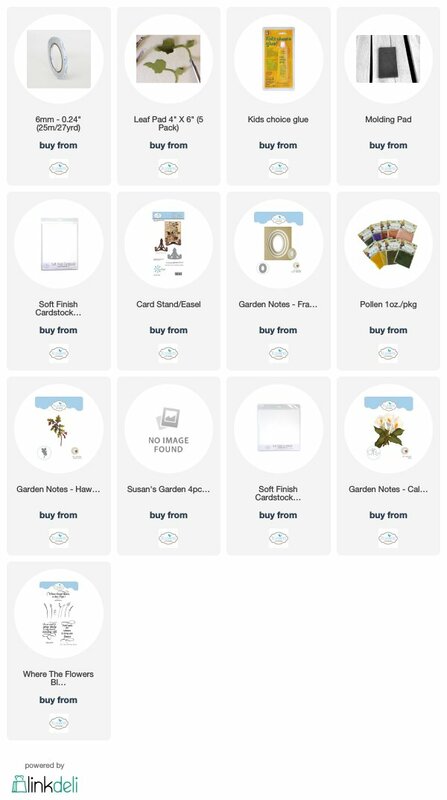 Elizabeth Craft Designs supplies used in project are linked below just click on it will take you direct to site. Today my card features another new release of Susan’s Garden Note – the Calla Lily. I am really loving this new release of Susan’s but I love all her releases. Step 1 From green cardstock cut couple of branches using Garden Notes Hawthorne. Add berries using Nuvo Crystal Drops set aside to dry then do back side. Step 2 Form card base 5″ X 7″ from white Soft Finish Cardstock (I like to use the 110# for card base). Step 3 The oval is a piece I had saved when I used the next to largest Garden Notes Frame It – Oval ( never through those pieces away). I used some Distress Oxide Inks to make a background on the oval. Attach to card front using Clear Double Sided Adhesive. Step 5 Stamp sentiment on card front using black ink. Step 6 Using Kids Choice Glue adhere Hawthorne branches then add lilies and leaves. 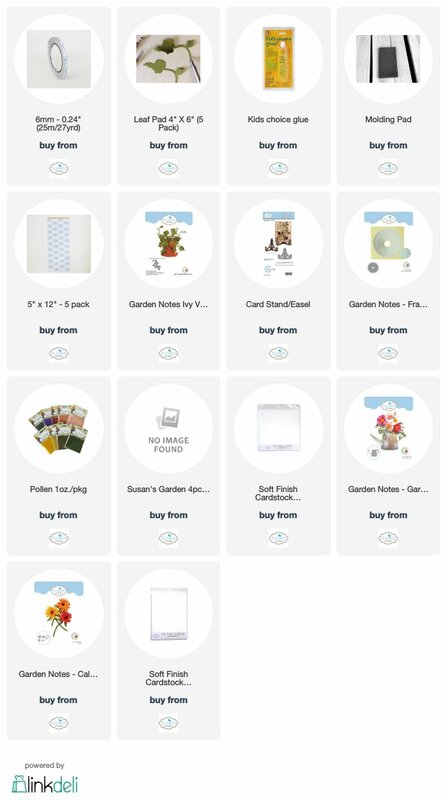 For any of the Elizabeth Craft Designs supplies used just click on picture it will take you directly to their site. Hope you have enjoyed this tutorial today.